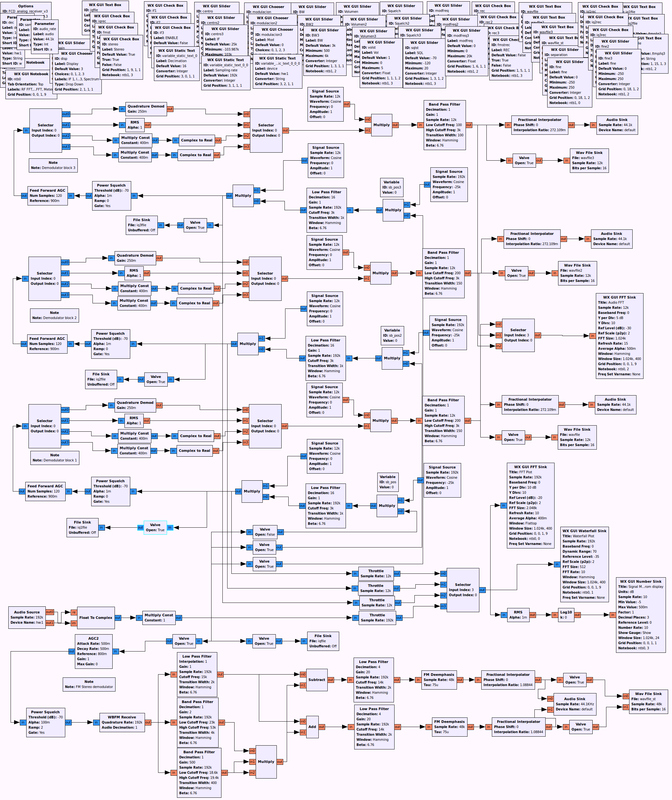 It seems that every SDR HAM enthusiast is forced to produce an excedingly overbloated, confused and unreadable GNURadio companion sketch to prove his habilities. Well, this is mine. So I’ve just build My First General Analog Receptor ™ for GNURadio using Companion to get in touch with the matter. 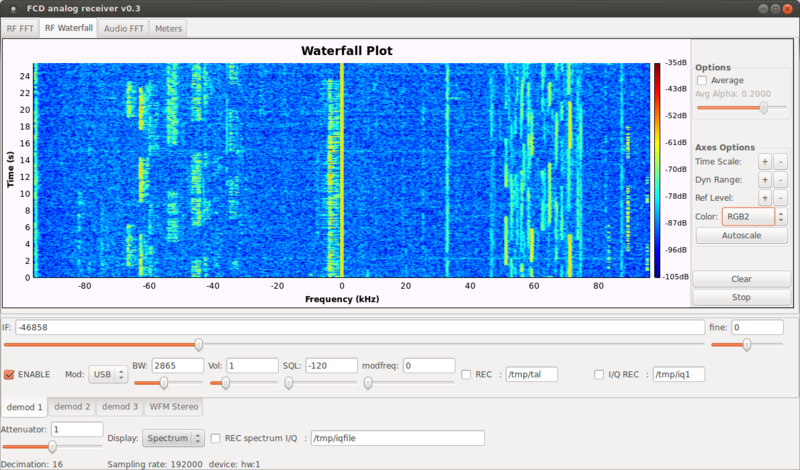 It’s quite limited as gnuradio-companion is more of an mathematical design tool than programming scheme. The receptor is intended to have the best reception quality, and usability (Disclaimer: I’m not an communications engineer). Of course it’s totally open and free software. Feel free to tinker and modifiy, then inform me, if you like. It’s aimed to Funcube Pro Plus as it’s my latest toy, but can be used with any soundcard based zero-IF receptor. 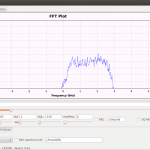 Simply change the samp_rate frequency (please note quirks) and hardware device (currently alsa HW:1) due of it hasn’t any frequency selection, do it externally. Many general impovements and fixes. Please check it. Sensibly improved demodulator levels. Now clipping noise is greatly reduced. USB / LSB bandwith filter corrected. 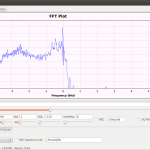 NFM bandwith now adjustable over 3KHZ. Some optimizations on demodulators’ path. Less CPU occupation. IF tuner position now accurate whatever the sampling rate selected. 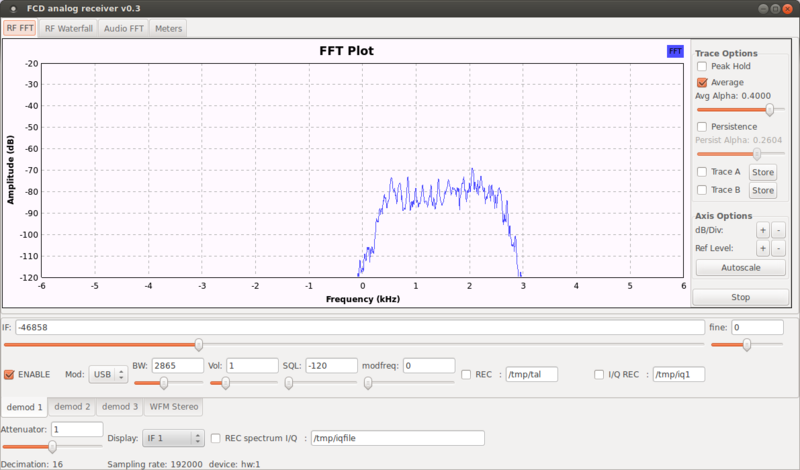 Constant aufio level on amplitude modulation modes due to new AGC. 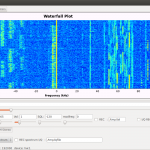 Continuous selectable bandwidth from 0.5Khz to Nyquist for each decoder. 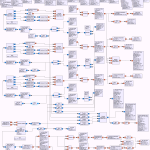 Ring-modulator audio descrambler for each demodulator. Can also be useful with SSB. 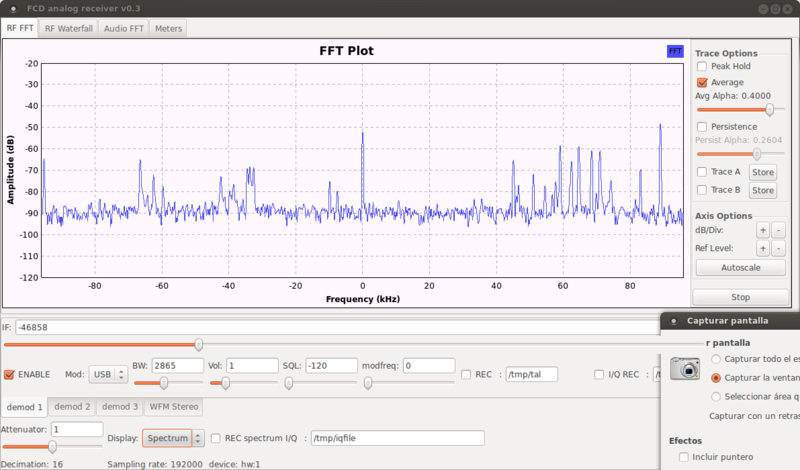 FFT spectrum of demodulated audios. Also big. Fire the python application. Upper tabs selects visualization. Lower tabs selects demodulator. Lower selector changes visualization between full spectrum and any of the demodulators IF for any of the visuals (FFT, waterfall and audio). No audio spectrum for full spcetrum. 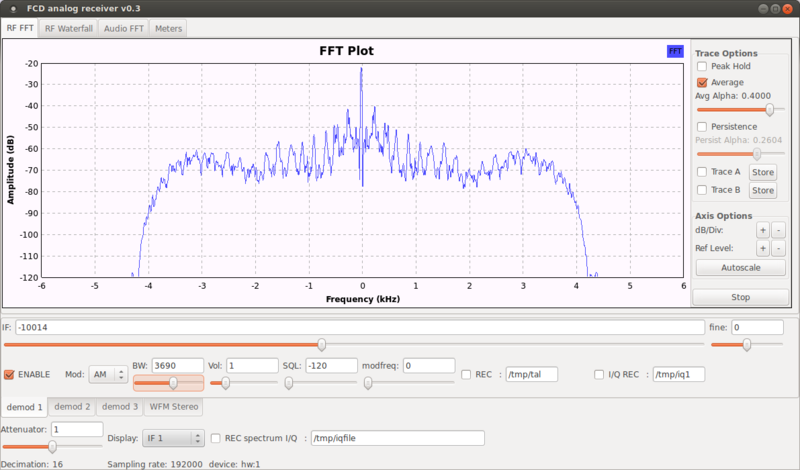 On each demodulator, select the frequency by moving the IF slider just under the desired spike. Slider size and position is carefully adjusted to match that on visualization (only for 192Ksamples rigs, I guess). Then switch to IF visualization for further adjust. Please note that IF visualization and demodulator tabs are independent, you can be moving parameters on other demodulator than you are seeing. No sound at all? Try enabling decoders (first is enabled by default) and lowering Squelch! 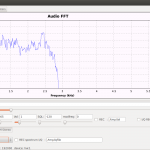 Enabling FM Stereo disables the rest of decoders. It makes sense as FM Stereo consumes all the bandwidth. Starting the program creates all the I/Q and WAV files with 0 size. See no way to avoid it. 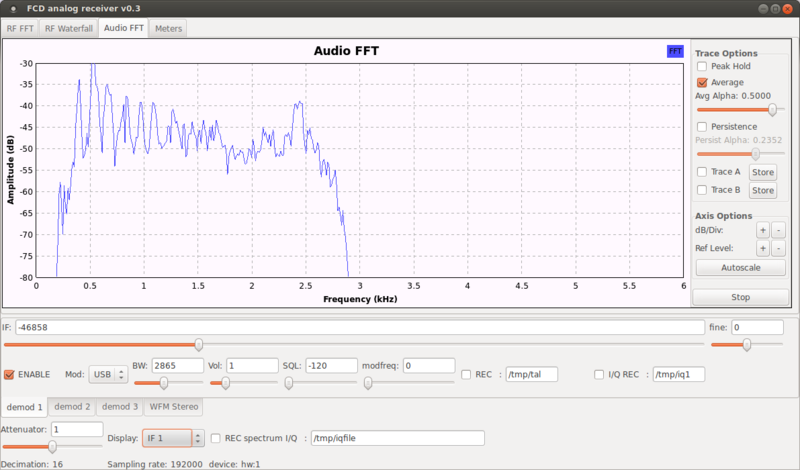 On v0.2, if BW if set too wide in USB/LSB, spectrum can “overflow” into audio range due to decimation. Removing decimation is too costly. 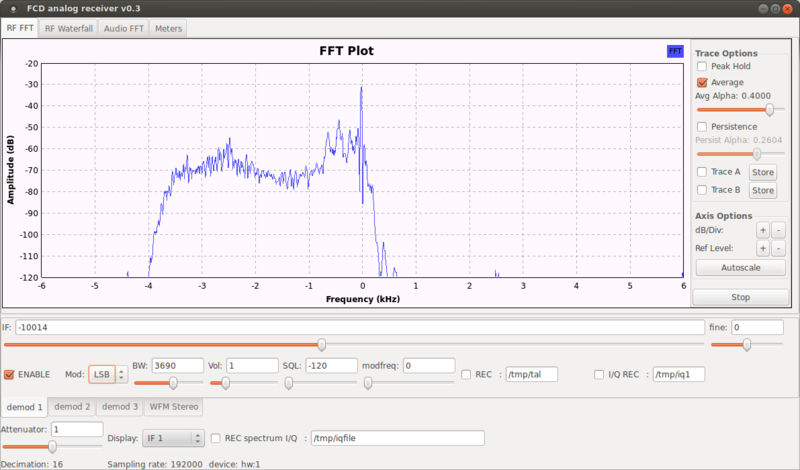 Application fails when sampling rate less than 192.00 due to FM Stereo filters width. Please unplug all FM Stereo modules on that case. In some computers audio gets corrupted. Try modifying application priority. You tell me. Or better correct, then tell me. 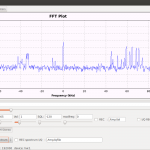 Some form of frequency selection for FCD, FCDPP, or SI570 tuners. Now with video. 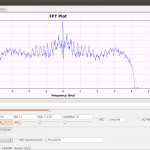 Demonstrating FM and triple demodulator (v0.1). Proper screencast soon.